Koro and Kuia, the Weka chicks' grandparents, are coming to visit. But how will the Weka chicks greet them? Fortunately the little Kiwi has a plan. 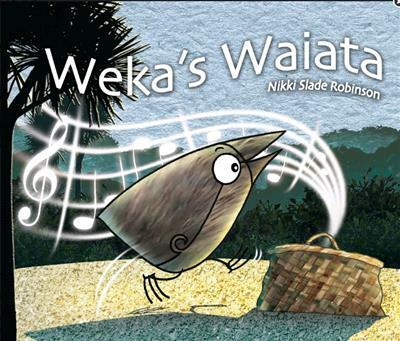 Weka's Waiata is a sequel to Ruru's Hangi and The little Kiwi's Matariki, winner of the Best Picture Book at the 2016 New Zealand Bo... read full description below. Koro and Kuia, the Weka chicks' grandparents, are coming to visit. But how will the Weka chicks greet them? Fortunately the little Kiwi has a plan Weka's Waiata is a sequel to Ruru's Hangi and The little Kiwi's Matariki, winner of the Best Picture Book at the 2016 New Zealand Book Awards for Children & Young Adults. Nikki Slade Robinson has illustrated over sixty children's books and readers. She has also both written and illustrated a number of books published by Duck Creek Press including The little Kiwi's Matariki, Ruru's H?ngi, I Am An Artist and Roadman Boogie.